The Laredo Kid – Has WWE Finally Discovered The Next Rey Mysterio? As the weeks proceed to pass by it appears to more and more likely that Rey Mysterio will not ever be returning to the WWE. Recapping the situation, Rey had issues with the company and desired to sever ties to work for AAA in Mexico, Lucha Underground or take up acting. Although his contract would have otherwise been fulfilled, the WWE had taken advantage of a seldom utilized clause in the contract, freezing it due to inactivity from time off because of injuries. This effectively rendered Rey trapped in his contract indefinitely. This did not stop Mysterio from appearing via prerecorded video at AAA’s biggest annual extravaganza Triplemania XXII, which ran the same night and outdrew WWE’s Summerslam, where he informed his fan base in Mexico that he would be seeing them soon. Rey had also showed up backstage at Lucha Underground at one point, angering his employers in WWE. Prior to Survivor Series Mysterio met with Vince McMahon at a Raw and then flew home instead of touring with the WWE, and while creative of the company had been told to come up with a story line for Rey lasting through Wrestlemania 31, he has not yet appeared and word is he will be released vey soon. Rey had been a major draw in WWE, especially in the growing Latino market and it is felt within the company that this void must be filled with a suitable replacement. With Alberto Del Rio(now Alberto El Patron) and the original Sin Cara both released this task is even more urgent. Kalisto, formerly known in Mexico as “Samuray del Sol”, is currently performing in NXT, WWE’s farm league and is rumored to be making his way to the main roster soon. The problem here is that he is rumored to be unmasked and repackaged as a flamboyant hairdresser, a gimmick which he is said to play in an outstanding fashion. WWE representatives have denied this, but they continue both scouting and courting Hispanic wrestlers. Henry Cejudo, an American born to Mexican parents and and Olympic Gold Medalist wrestler was being pursued to by the WWE but ultimately signed with UFC instead. The latest talent from Mexico being considered is The Laredo Kid, who impressed agents in a recent tryout with another being scheduled in the Spring of this year. 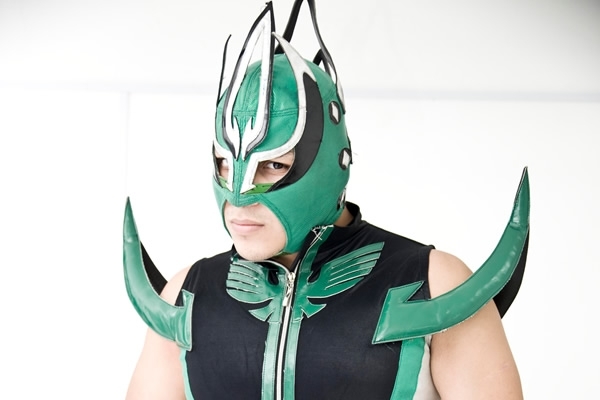 A bit of a background on Laredo, he began his career in 2003 as “The Exterminator” before being refurbished under his current moniker when signed to AAA Lucha Libre in 2005 and quickly formed the faction of Real Fuerza Aérea(The Royal Airforce) with other high flying technicos Super Fly, Rey Cometa and Nemesis. Over the years the membership of this group would expand adding Aero Star, Pegasso, Argenis, Atomic Boy and more with the legendary Octogon serving as a mentor. The group would continue until 2013 when it disbanded. While continuing to compete in AAA, Laredo would also travel to the United States, Japan and Puerto Rico picking up different styles in NOAH, WWL, NWA Anarchy in addition to other promotions. These international experiences demonstrate that Laredo can overcome language and cultural barriers that often prevent performers from different parts of the world from succeeding in the WWE. This may be a major reason the company is so interested in taking a closer look at the luchador. The Laredo Kid maintains an exciting, daredevil moveset with the cornerstone being his finisher the “Laredo 630”, which is 630 degree rotation into a senton from the top rope. He also uses a 450 Splash or a Pheonix Splash as finishers as well. He possesses an impressive tornillo in which he will perform a springboard to the outside with a double and sometimes triple corkscrew. Though he has competed throughout the globe, being the next Rey Mysterio for the WWE is a precarious venture to undertake. Mysterio was already a highly accomplished and popular name by the time he arrived in the WWE with prolonged tenure as the centerpiece of the cruiserweight division of WCW during the Monday night wars. Rey was also more successful during his start in Mexico than Laredo currently is. This is not meant to imply that Laredo signing with the WWE will unavailing. With the machine behind him the sky’s the limit as long he catches on with the fanbase. This potential jump to the largest promotion in the world ought to be about making a name for himself, not replacing Rey Mysterio. Philly Phil is best described as a "sports entertainment" generalist working many positions in the pro wrestling industry from in ring performer to announcer to referee to promoter. Now he works from the outside covering the sport through writing and video.